New Year, New Me… Wait! NO!! 🎉 Happy New Year, Gentle Reader! Every new year finds articles and lists of the same old cliché of “new year, new me.” Ugh!😞😴 I get it. All the resolutions and fresh starts and what not. It makes sense. It really does. Do I really need a “new” me? I used to fall into that same sort of pit of quicksand every year. One day during rehearsals for Bullets, she told me that she was inspired by me because I live honestly and fully in my passions. 🙀I was floored. What can you say to something like that? It is one of those moments that made me look at the way I live. I love who I am. 💖Some people may not, but I do. So why in the world would I need a “new” me? What I would like, however, is a better me. One may ask, well isn’t that the same thing? No. It isn’t. A new me would imply that I don’t like enough of myself and that I want to overhaul most of what makes me me. I just want upgrades to certain things. There are times I get too comfortable in my methods and routines that when things get a little shaken up, it turns my world wackadoo. I don’t know about you, Kind Reader, but when that happens, I stress out and worry that my whole way of prepping is going to fail. That is SO not a good mindset to be in. It just so happened that I had that experience twice last year. In the end, it was a wonderful learning tool for myself, but if I can get out of my “usual” I think I would be more effective and efficient for projects that have a different pattern than what I am used to. I am planning to head back into study mode for 2018. Because I want to be sure that I am learning and growing, I decided that it would be beneficial to stay off of the boards while getting my system upgrades. I want to be as open to this new information as possible. I feel that jumping from show to show like I have done the past 6 years would divide my attention too much to accomplish my task as fully as I would like. So not new, just better. So forget all that new year, new me, Gentle Reader. I am sure You are a pretty amazing person already. 👏👏 So what do you think about the “New Me” madness that media tries to shove on us? If you would like to, which one of your “files” would you like to upgrade? So far, I’ve “caught” him every show! LOL! This has been a great experience overall. I know that wasn’t what you were expecting me to say. Yes, it did have its struggles like all rehearsals do and I will get into that in just a sec. The great thing about Carl, though, is that he has this arc in the show where he goes from strictly seeing right or wrong to having some doubts about whether things are as simple as that. Dear Reader, do you recall last year when I spoke of having a hard time with the rehearsal process of Lend Me A Tenor because I wasn’t understanding what was being asked of me. 💀 I wasn’t asking the right questions to get what I needed so in the end, I just had to let it all go and focus on the mechanics. And that helped. But I learned that I needed to work on MY communication. In this process, I would hit points where I wasn’t understanding how A and B connected, but knowing what I knew now, I was able get what I needed to give the director what she was asking for. That experience itself ended up not only being super fun but it was one of the greatest lessons I learned.💖 I will be forever grateful that I was a part of it. The one area that freaked me out the most was that they respected our time a little too much, I felt. 😳LOL! 😂I had almost two weeks off in the middle while they worked on other scenes I wasn’t needed for. It was cool and all, but when it came to putting all together, I was in panic mode trying to make sure that I was synced up with everyone in the scenes we had together. However, in the end, through all the stress and panic, the show quickly smoothed itself out and the nitpicking got to happen almost right away when it came to full run-throughs. Gentle Reader, this has unexpectedly become a favorite role in my list of credits for sure. Have you ever had an activity or event that you weren’t certain about that ended up being one of the best things you’ve ever done? What made you nervous about it? How did you handle it? Let me know in the comments! Until next time, Dear Reader, have a wonderful day! Last night, towards the end of rehearsal, I finally had the opportunity to listen to Rachelle Abbey sing “Fly, Fly Away” from Catch Me If You Can. Now, look, I think Kerry Butler is great, but I what I heard last night blew the cast recording out of the water. I can’t stop thinking about it to this very minute. I am so excited to hear this at every show. I got chills and everything. This is one thing. The other thing, not so good. But then, Dear Reader, I got home and I heard about the terrible news from Manchester. It is just so utterly heart-wrenching. Of course, to feel bad for the victims is natural, but I also feel terribly for the artists that were performing. What a weight that must be! I know it isn’t the artists’ fault in the least, but if it were me in that situation, I would be devastated. Such a cruel act and for what purpose? The average age of Ariana Grande’s fanbase is estimated at 18-23. What is the purpose of targeting young innocent people? A group has taken credit for the attack, of course. If it is them, ( like King Cheetoh, I refuse to say the name as I do not want to contribute to their self glorifying ways) I suppose the idea of a strong self assured woman really terrifies them. And for that same woman to be a beacon for younger people must really shake their manliness to nothing. All I can think about today is the loss of life, the unrealized potential of the victims. It truly is a sad situation to realize that the possible ideas and lives of the victims could have advanced our world to peace, or not (I mean, I have to be realistic. However, I am ALWAYS hopeful of the positive.) The other think I am also dreading is how politicians will use this. It is a terrible thought, I know, but again with the realism here. Why is it that those few awful people can bring millions and millions of good people to their knees in sorrow. Why don’t the acts of kindness change the world in the same fashion? I know that this song is sung by a someone in love to her fiancé, but when I think about the kids at that show, I also think about the pain of the parents. It is such a heavy, heavy situation but I can’t stop thinking about it. Dear Reader, I hope you are safe where you are. I hope you follow what makes you happy. I hope you remain strong in spirit and hope. This is, perhaps, my most favorite picture taken of me. This is wholly and fully everything about me in one shot. Thank you to the amazing Rhona McFayden! Hello! How have you spent the last few weeks? I have been working through the closing of one show 😞, starting a new job 💵, and beginning rehearsals for a new show😄, so life has been a hurricane of madness! But it is all working out in the right direction, so I shan’t complain about it. How can I, when there are worse things in the world? 🎭A Chorus Line ended three weeks ago, and still this week, I am reminded of the show by people who happened to have seen it. I am grateful for the many very kind words of the show and my portrayal of Paul. It means the world to me. The thing is that they don’t mean so much because it may be validation of whether or not I am good at acting, but that the approach that I took with the big monologue to make it my very own while keeping true to the show’s legacy, and as powerful as it should be, worked. I am a very physical actor. I gesture. I use all of my body for everything and not just my face to tell a story. This means that to do the monologue the same way it is traditionally done would totally ring false in me, which could show in the performance. It was a chance I really didn’t want to take, especially since this was such a personal role to play. So, I set it up the way that felt good to me and when I rehearsed it for the first time the director, Bill Starr, loved it. There were, of course, tweaks made and suggestions, but what we were able to wring out of each sentence felt like truth. And it felt right. For me. The hope was that the audience wouldn’t be pushed away in this version. Then, something remarkable happened. People began telling me that as the monologue went on (the first few times I rehearsed it, it felt like it went on and on and on…) people said they began to lean in; they wanted to know more about Paul’s story! ❤️ I am certain that there were people that wanted it to be traditional, and I get it, but they didn’t dislike what they saw. What at first seems like a wonderful dauntingly incredible challenge became a piece that I am extremely proud of. I have loved ALL of the amazing opportunities that I have had but to say I am proud (which I almost never do) of a piece of work is rare. There are literally a handful of pieces that would qualify. And that being said wraps up my second run of A Chorus Line. I loved the show the first time I was in it and I loved it this time around too. So many wonderful new people that I can now cheer on and be a fan of. ❤️ That’s one of my favorite things about theatre. Two weeks ago, we began the process for Catch Me If You Can. Kind Reader, if you have seen this show, please tell me, did you find it strange that nearly every song has to have a scene in the middle of it? While going through the script, I found myself wondering what Terrance McNally, Marc Shaiman and Scott Whittman were thinking. There is incredible music throughout this show and it feels like it abruptly stops the number to add the scene. Maybe that was just because I was reading through and making notes and whatnot. I shall keep you posted on the findings of this query. The other thing that struck me was that even though the script is only 120 pages, if FEELS longer. I am curious if that is because of the song scenes. Only time shall tell. Just Announced…The 2011 Tony Award Nominations!! 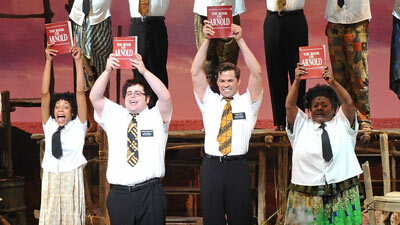 Book of Mormon leads the nominations with 14!! Okay everyone, this is one of the events that I wait for every year! Here is the full list of the nominees. If you just want a breakdown of how many each show got, just scroll to the end of the post. The Tony Awards will be aired on June 12 @ 8:00 PM from their new home in the Beacon Theatre. Drumroll please…. Beth Leavel, Baby It’s You! Did any of these shock you? Were you surprised that anyone wasn’t on this list? Were you surprised they were? Let me hear ya!